Notes: Special thanks to Vivian Lick of the Buchanan District Library for newpaper articles. I would also like to ad that the theater pictured is not the Hollywood theater that was in Buchanan,Mi. The vertical sign reading Hollywood is the only thing about the picture that was familiar in Buchanan,Mi. OOPs My mistake that is a picture of the Tivoli theater in Stevenson. I would also like to ad that the theater pictured is not the Hollywood theater that was in Buchanan,Mi. The vertical sign reading Hollywood is the only thing about the picture that was familiar in Buchanan,Mi. 421 West Front St. was the home of Don Pears not the location of the theater. The theater was located at 118 E. Front St.
Aug 3, 1933 Issue - New Hollywood Theatre Opens Friday Night New Wide Range Sound Equipment; Opens with Elmer the Great, featuring Joe E. Brown. Tomorrow, Friday August 4th, the re-named Hollywood Theatre (formerly Princess) opens with the new perfected Wide Range talking picture equipment, together with the boy with the air-cooled tonsils, Joe E. Brown in Elmer the Great, an original baseball story adaptation by Ring Lardner. Joe takes you from his small home town in Indiana right thru to his ringing climax as the season's greatest baseball star. Its comedy, and plenty of it, from start to finish. 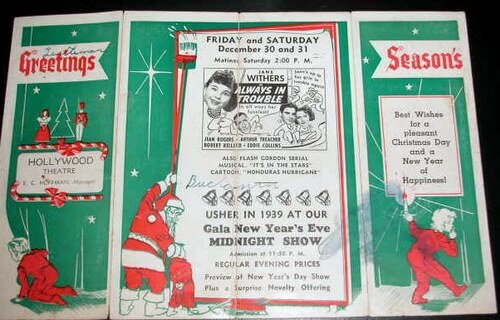 On the same program is a Technicolor musical review, Hey, Hey Westerner, plus Lowell Thomas in Whale of a Yarn and a Mickey Mouse cartoon. Sunday, Monday and Tuesday brings Buchanan the smashing miracle picture of the year, 42nd Street. Brilliant music, dazzling stars, new songs and wise-cracking Broadway and show world dialog that is sure to please. New song hits such as 42nd Street, and Shuffle off to Buffalo are given full play in the picture. Added attractions are, An Idle Roomer, two reels of roaring comedy and the always popular Paramount talking news. Wednesday and Thursday are Bargain Nights at the Hollywood, and the first Wednesday and Thursday brings that new sweetheart team, James Dunn and Sally Ellers in their latest starring picture together, Hold me Tight. It's James Dunn and Sally Ellers as you like them best. Screen Snapshots of Hollywood stars at home and at play, and a Silly Symphony cartoon completes the program. 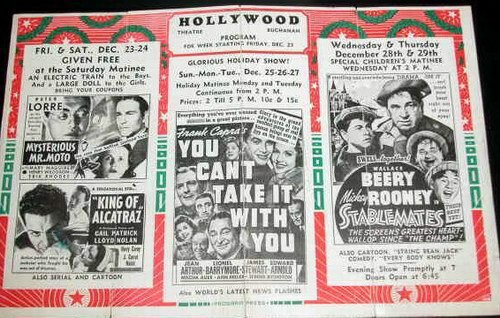 The opening announcement of the Hollywood Theatre appears on the last page of this issue. 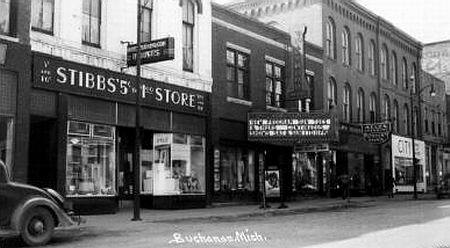 Buchanan welcomes the opening of the Hollywood and its new policies. July 27, 1933 Issue - Princess Theatre will re-open as the Hollywood The local theatre will be opened about August 4, with a new manager, H. C. Monroe, and a new name, The Hollywood. Manager Monroe was in Buchanan yesterday and stated the he is installing new wide-range, sound-perfected machines, representing the last degree in motion picture equipment. This wide-range apparatus makes possible the full reproduction of every note and quality of the human voice. July 20, 1933 Issue - H. C. Monroe, former Watervlet movie theatre operator, takes over property. Open Thursday, July 27. The Princess theatre will be opened again Thursday, July 27, the opening day of the Centennial under new management and perhaps under a new name. The business and the equipment being purchased by H. C. Monroe, former Watervlet Theatre operator, late of Omaha Nebraska. Mr.
Monroe states that he expects to arrive in Buchanan in few days and immediately will take steps to rush installation of new equipment for the beginning of the Buchanan Centennial and Home Coming July 27. A new sign and several changes in the advertising display system will be the changes in the exterior. He states that because of the recent installation of comfortable, upholstered seats plus adequate ventilation, attractive decorations and correct acoustics, the Princess offers everything to the theatre goer that any theater can offer anywhere. A system of popular prices adapted to present day income will prevail. Monroe is a veteran in the picture business, having formerly operated theatres at Watervlet and at Bangor, in addition to several years of experience in distribution and advertising. He plans to install complete new wire-range, high-fidelity sound equipment, superior to anything previously known locally. In addition to technical improvements he assures his prospective patrons of a march of a New Season talking motion pictures hits from every major studio. May 1960 - Don R. Pears, owner of the Hollywood Theatre, will be candidate for Congress on the Republican ticket in 1962. He hopes to succeed Representitive Clare E. Hoffman of the Fourth Michigan District, one of the senior members of Congress. Pears has been active in politics for some years, serving in the state legislature and now is in his second year as speaker of the house. He plans to run for the legislature again this year and seek a second term as speaker.